Today’s job numbers beat expectations, with 196,000 jobs added and a small positive revision to the prior two months. On a rolling 3 month average, job creation fell to the lowest level in over a year, but only marginally. While jobs growth is still solid, it has cooled a bit. That isn’t anything to worry about, but it is something to keep an eye on. Wage growth picked up dramatically last year, with 2016-2018’s sideways movement in the year-over-year change of average wages paid surging. 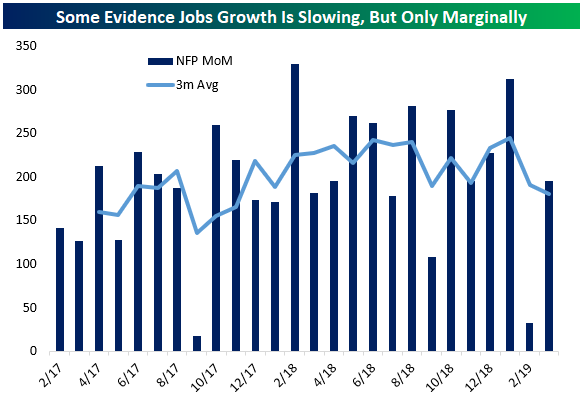 Over the last few months that growth has once again been moving sideways, albeit at a much higher rate of growth than we’ve seen for almost all of the current economic expansion.